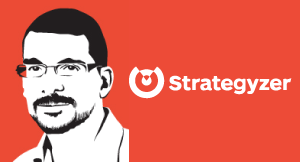 Alex Osterwalder talks about the affect that outsized valuations of superstar (unicorn) startups can have on entrepreneurship. He asks us to think about the effect on entrepreneurship when a startup with revenue projections of $50 or $100 million dollars is compared to one of these superstar startups. I think that is that general danger at the moment that these companies are so highly valued and so high, it almost leads to you know a lot of entrepreneurs wanting to do the same thing and be the same way, and you know young entrepreneurs start to think that if they build a 50 or $100 million business you know that is worth. Maybe makes revenues of 50 or hundred million or is worth 50 or 100 million and they haven’t achieved something. So I think these crazy numbers are also a danger because you know that they kind of make the people that don’t get that far look like they are complete losers, which is obviously not the case because building any type of business is extremely hard. And I think that sometimes gets lost when the press kind of you know pushes these crazy, amazing, fascinating stories but I think it does have an impact on entrepreneurship in general. And that’s dangerous and I think we should kind of push against that a little bit as well. What qualifies as a successful SaaS startup investment depends on the type of funding / financing source. VCs have very high investment return expectations.